"Toward an American Identity" featured two paintings. 1993 - The Museum of the City of New York, New York City, NY - Solo exhibition - 17 paintings. 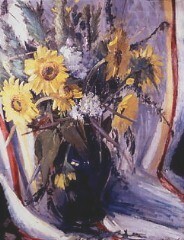 1990 - The Butler Institute of American Art, Youngstown, Ohio - 30 paintings. 1989 - The Museum of the City of New York, New York City, NY - Group show. 1986 - Passsaic County Community College, Patterson, NJ - Solo exhibition - 50 paitings. 1982 - WPA Group Show - Avery Fisher Hall, Cork Gallery, Lincoln Center, New York City, NY. 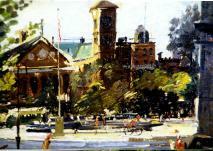 1979 - World Trade Center - Custom House, New York City, NY - Solo exhibition - 70 paintings. 1977 - "Then and Now" WPA Artists - Parson School of Design, New York City, NY - Group show. 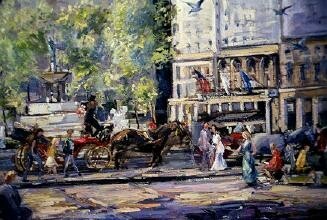 1973 - Grand Central Galleries, New York City, NY - Solo exhibition - 25 paintings. 1966 - "Directions in American Painting" - Carnegie Institute, Pittsburg, PA - Group show. 1966 - The Brooklyn Museum, Brooklyn, NY - Group show. 1966 - Allied Artists - New York City, NY - Group show. 1962 - New York University, Loeb Student Center, New York City, NY - WPA Artists - Group show. Greenwich Village Artists by Invitation.